This capitalization table template is a helpful tool for a startupHow VC’s Look at Startups and FoundersA guide to how VC's look at startups and founders. The odds of being funded, the odds of commercial success, traits they look for, good vs bad pitches, and how to increase your chances of getting startup capital from a venture capital firm. company or early-stage venture to list all the company’s securities. 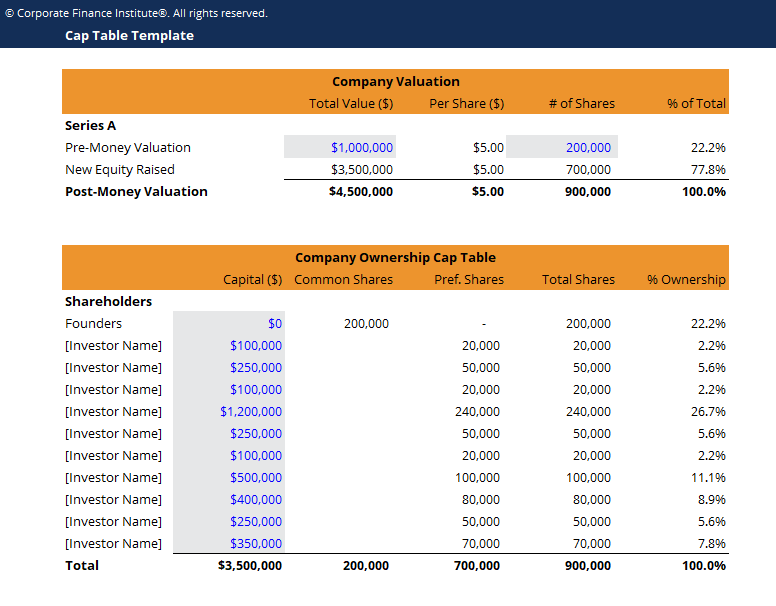 A cap table is a spreadsheet for a startupHow VC’s Look at Startups and FoundersA guide to how VC's look at startups and founders. The odds of being funded, the odds of commercial success, traits they look for, good vs bad pitches, and how to increase your chances of getting startup capital from a venture capital firm. company or early-stage venture that lists all the company’s securities such as common shares, preferred shares, warrants, who owns them, and the prices paid by the investors for these securities. It indicates each investor’s percentage of ownership in the company, the value of their securities and dilution over time. Cap tables are created first before other company documents in the early stages of a startup or venture. After a few rounds of financing, the cap tables become complex, and it lists the potential sources of funding, initial public offeringsInitial Public Offering (IPO)An Initial Public Offering (IPO) is the first sale of stocks issued by a company to the public. Prior to an IPO, a company is considered a private company, usually with a small number of investors (founders, friends, families, and business investors such as venture capitalists or angel investors). Learn what an IPO is, mergers and acquisitions and other transactions.